Friday, September 18th, marked my local TV debut here in the Quad Cities. I was on Paula Sands Live (PSL, if you're a local!) to promote a screening of "Fresh... The Movie" that was sponsored by the Quad Cities chapter of Buy Fresh, Buy Local and Progressive Action for the Common Good. This documentary is a great showcase of awesome farmers using innovative methods for providing incredible, fresh food. I highly recommend it! The next morning, it was off to the market once again. Maybe it was the excitement from the PSL and the movie the night before, but everything about that day was awesome. 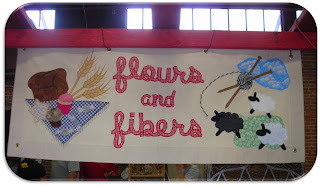 It started with the debut of an absolutely beautiful banner that was hand-quilted by my mom. This banner will follow Em and I in all of our future endeavors. Thanks, Mom! A couple of hours after the market started, I had a very special visitor. Right when Em and I started selling at the market, a really great family stopped to talk to us. 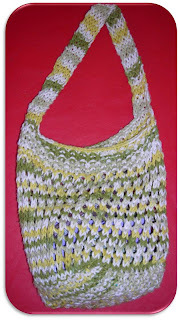 One of their daughters asked me if I could show her how to make the bags I was selling. I love the fact that she is so young and interested in knitting. A few weeks later she stopped by and I gave her a pattern that I wrote down for her. 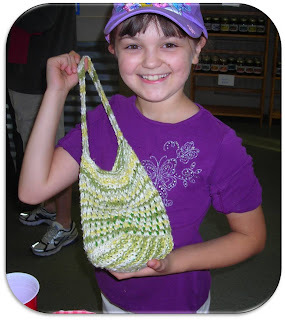 Well, last week at the market, she stopped by with her very own market bag! Meet Bronté (and her bag)! The next photo shows a close-up of the bag. What a beautiful job! I may have some competition. Thanks for showing me your work, Bronté! 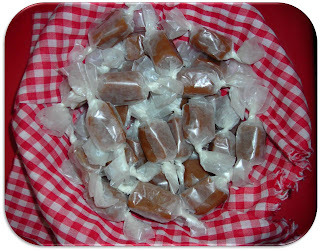 The most surprising part of the day came at the end, when I realized I sold an entire batch of Emily´s amazing caramels. Seriously, people were raving about them. Emily had made them the week before when we were both at our parents house. I was sorry she wasn't there to see it, but I was pumped to let her know she's getting rich off caramels AND she gets to sleep in on Saturdays. We're currently trying to figure out a way for her to ship them here, so the caramels may be back soon; you'll just have to stop by the market to find out!